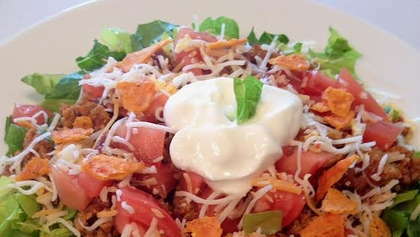 Say olé with this fresh turkey taco salad for a fast and easy weeknight meal. Pan-fry ground turkey until no longer pink. Add water and seasoning mix and stir. Let gently simmer until water has dissipated and turkey is left slightly moist. Meanwhile, fill a plate with chopped Romaine lettuce. Top with a few spoonfuls of cooked turkey. Top turkey with tomatoes, salsa, cheese, and broken corn chips. Finish with a dollop of Greek yogurt (or sour cream) on top.